At Country Taste we pride ourselves in providing an excellent service with a personal approach. We will assist and guide you through the options available and create menus to suit your budget and occasion. We have a range of menus and can provide and deliver throughout North Wales and further afield. We aim to provide delicious, freshly prepared food, locally sourced where possible, with excellent efficient service to create a memorable occasion. Whatever the occasion Country Taste has the experience to cater for events in a professional manner, whether small or large. For wedddings and large events we will provide onsite kitchens when required. 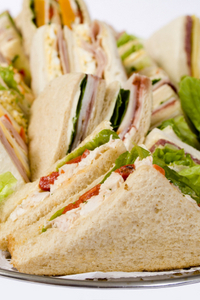 Business Lunches, Meetings,Functions, Weddings and Event Planning - Parties and Buffets - Funeral Teas - Dinner Parties - Private Dining - Hog Roasts - BBQ's - Afternoon Teas - Garden Parties - Carvery Buffet - Homemade Family Hampers - Childrens Parties. If you have any questions regarding our catering services please feel free to contact us. We will be happy to answer all your question.